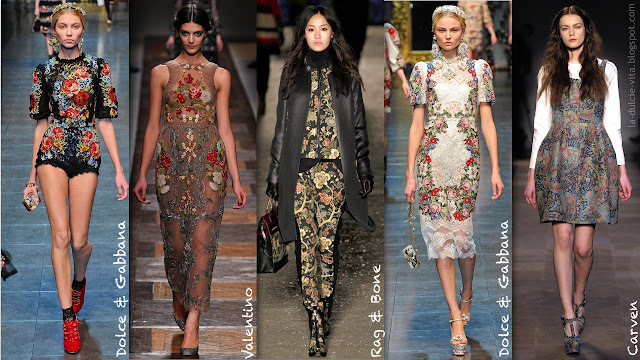 Since September is fast creeping up on us, I have decided to do a series on the trends thats I'm loving this Autumn and Winter starting with the new take on florals in the form of tapestry, from Dolce & Gabbanna and Balmain's takes on traditional needlepoint design to Carven's folk art inspired paisley patterns. For even more things tapestry inspired check out my new pinterest board. Dolce & Gabbanna lead the way with this trend. Their collection is inspired by traditional Sicilian dress and the simple needlepoint flower designs on black and on white remind me of a Mary Poppins style carpet bag and provide a homely edge which complements the glamourous baroque style of their other pieces, which I will also be covering. My favourite pieces are the tiny playsuits and I love the chandelier-esque earrings too. Valentino's ready to wear collection also took inspiration from folk costume but turning it elegant and classy with floral needlepoint designs so delicate they looked oriental. The couture collection also references the warm pinks of floral 18th century tapestry design. Rag & Bone give an urban edge to their tapestry inspired pieces, the coats have patent leather and fur trimmings which are two other big trends for this AW. My favourite look is the co-ordinated bomber jacket with trousers in the tapestry pattern which juxtaposes traditional with modern to great effect. Carven used paisley for their take on this trend. Flared hips were a nod towards to the continuing peplum trend and created gorgeous silhouettes. Guillame Henry was inspired by Hieronymus Bosch's Rennaisance painting 'The Garden of Earthly Delights' for his earthy autumn palette. Bosch's painting has been a source of inspiration to many designers including the late Alexander Mcqueen. number one: Flower tapestry skater dress by Nishe on Asos - I love the shape of this dress, I've got a few similar to this and they're so flattering. If you're not a dress kind of girl, they also do a gorgeous pair of tailored shirts in the same fabric. The colours are very similar to the Carven dress above - get the look for less! number two: Tapestry motorcycle jacket on Free People - This is beautiful! The feminine colours and pattern work beautifully with the rugged style of the biker jacket. number three: I fell in love with these short cowboy boots from Topshop as soon as I saw them, I've been looking for a new pair of boots for winter and I love this shape. With this pattern on they are so kooky and cute. The co-ordinating blazer and skinny trouser combo creates a sharp androgynous silhouette which really shows off the striking pattern. number four: 'Stitch' by Cath Kidston, I got this book for christmas and haven't used it yet, but it's full of traditional needlepoint designs.... very similar to those on the D&G catwalks which you can update your look with. number five: These shorts from New Look are a lovely transitional piece to get you from summer through til winter. Slipper style shoes seem to be the most popular way of using the tapestry style and these from Blink at new look are my favourite pair from those I've seen. i really LOVE this trend at the moment! It's quite interesting to see where designers got their inspiration from for this trend, since the trend is truly artistic. 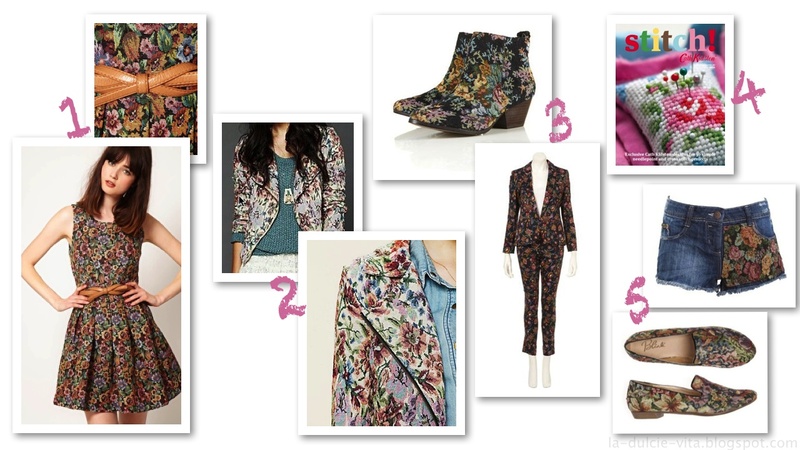 Although there are most likely ways, I noticed that because of the vibrant colors in the floral patterns it may difficult to incorporate it for the fall. How would you do it? Perhaps I will post about this on my blog. Love this post, love this blog - Keep it up! Great post and nice choices, dear! I've read your message on ifb: I like your blog, it's cute! Come to visit mine and follow me, if you want. I promise I will do the same! Have a nice week! Great Post! i love this trend so much at the moment! -Thanks for sharing and happy blogging! I've alays loved this tipe of print and twxture, but I agree with Mai, it's really difficult to pull off!